Bilateral relations between China and Vietnam over the South China Sea dispute have improved in the last couple of years as evidenced by the January summit between the two leaders. Nevertheless, as Ramses Amer and Li Jianwei argue, more needs to be done to further enhance conflict management between both countries. The “981” drilling rig incident in 2014, when China dispatched an oil rig to areas west of the contested Paracel archipelago in the South China Sea,* saw the most sustained period of tensions in China-Vietnam relations since the 1990s. Relations have markedly improved in the past couple of years, however, with bilateral political, economic, and cultural ties thriving, thanks to efforts from both sides. In particular, increased high-level talks have played a key role in keeping bilateral relations over the South China Sea – the most sensitive issue in the relationship – on a cooperative track. Both countries have accordingly established principles and mechanisms of conflict management by which to manage the situation. Nevertheless, as identified in this brief, more can still be done to prevent any potential re-escalation of tensions, especially in more sensitive waters. On January 12-15 this year, the General Secretary of the Communist Party of Vietnam, Nguyen Phu Trong, paid an official visit to China. Both countries attached great importance to the visit, which took place just before the 67th anniversary of the establishment of China-Vietnam diplomatic relations on January 18. 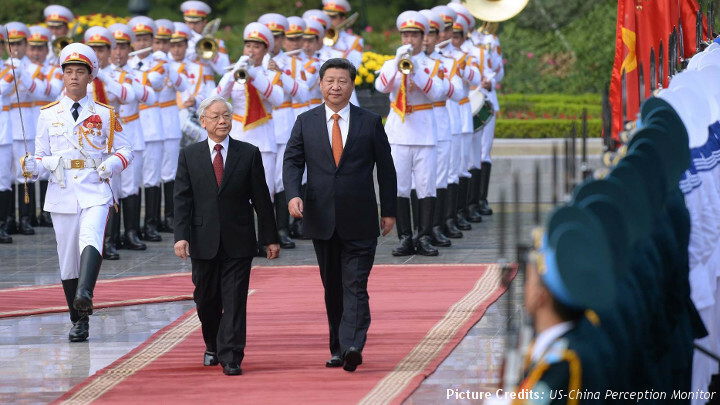 Underscoring the importance of the relationship was that Trong was the first top foreign leader that China received in 2017, with China’s President Xi Jinping hosting the welcoming ceremony. The achievements during Trong’s visit included a ten-point Joint Communiqué** which highlighted the need to: increase high-level meetings, cooperation, and exchanges between the two Parties; promote strategic connectivity and foster trade and investment ties; expand national defence and security cooperation; and enhance people-to-people exchanges. Fifteen important documents were signed for further intensifying cooperation in these different areas. Issues relating to the South China Sea were accorded particular priority, the result of which is highlighted in Point 6 of the Joint Communiqué. This emphasizes the guiding principles underpinning the management of sea-related issues, affirms the need to effectively implement the Declaration of Conduct and Code of Conduct, and calls for expanding cooperation in areas outside of the mouth of the Gulf of Tonkin (GOT). As such, the Communiqué – similar to previous joint documents signed during the three high-level meetings in 2015 and 2016 – stresses the need for effective management to prevent any escalation of tensions. Three basic components of bilateral management have repeatedly been emphasized. These encompass, namely, principles, mechanisms, and functional cooperation. The principles include, first, peaceful settlement of disputes through negotiation and friendly consultation; second, to study and seek transitional solutions that do not affect the respective country’s stance and policy; and third, not to take actions that complicate and expand differences. The bilateral principles are inked in the Agreement on Basic Principles Guiding the Settlement of Issues at Sea, signed between both countries in October 2011. Both sides agreed to follow the principles reflected in the 1982 United Nations Convention on the Law of the Sea (UNCLOS) and the 2002 Declaration on the Conduct of Parties in the South China Sea, to which both countries are signatories. Mechanisms have been established and adjusted through the years of bilateral interactions over the South China Sea issues. Currently they include four layers of communication from the top to the functional level: High-level talks of leaders of Communist Parties, governments, and Congresses; State Councilor-level talks, e.g. the Steering Committee for Bilateral Cooperation; Ministry-level Talks, headed by the Ministries of Defense and Foreign Affairs; and Expert-level Talks, including various working groups. Working groups are established to implement agreements reached by the upper-level talks, either to further explore possibilities of functional cooperation or to give advice for agreed cooperation projects. Since 2013, moreover, three hotlines have been established: one between fishery administrations; one between foreign ministries; and the third between the defence ministries of both countries to promote communication over issues of serious concern, including issues at sea. Functional cooperation activities are conducive to stabilizing relations at difficult times of bilateral relations, and currently activities mainly focus on the sea areas within the Gulf of Tonkin as well as off its mouth. Within the GOT, besides the Joint Fishery Cooperation Committee to manage fishing in the Common Fishery Zone (CFZ), cooperation projects include, inter alia, joint navy patrols, joint patrols of law enforcement forces (coast guards of China and marine police of Vietnam), joint exploration for oil and gas in the agreed transboundary area and relevant cooperation matters in this regard, as well as joint study on the management of the maritime and island environment in the GOT. Joint naval patrols in the GOT were first initiated in 2006, with 21 such patrols having been organized as of the end of 2016. The purpose is to promote co-ordination on keeping good order at sea, and in 2016 the content of patrols expanded to include joint search and rescue exercises. Joint patrol of law enforcement forces started in 2006, and, by the end of 2016, 12 patrols had been carried out. 2016 was the first year that the two countries agreed to carry out two joint patrols in the CFZ. Additionally, joint field surveys on oil and gas resources in the agreed area beyond the mouth of the GOT were also completed in April 2016. Thus, out of the roughly four geographical areas in the South China Sea contested between China and Vietnam, the Gulf of Tonkin is the least contentious: delimitation has been completed and cooperation is proceeding smoothly. Discussion and consultation on joint development and sea delimitation is also ongoing in the area off the GOT. More contentious are the Paracel Islands (Xisha Islands) and the Spratly Islands (Nansha Islands), together with their adjoining sea areas. While both countries have acknowledged the existence of dispute in the Spratlys and discussion has been ongoing on management of differences and cooperation on less sensitive issues including marine scientific research, search and rescue, and navigational safety and security, no consensus has been reached to deal with the area of the Paracels and its adjoining waters. Indeed, China’s official position is that there is no dispute relating to the Paracels. Consequently, they are not included in the bilateral talks on South China Sea-related issues. In spite of having established a largely functioning system of conflict management, mechanisms need to be further bolstered. Failure to do so runs the risk of new conflicting incidents arising detrimental to overall bilateral relations. First, it is necessary to continuously maintain high-ranking exchanges and meetings between the leaders of the two Parties and countries so as to promptly exchange views and tackle issues arising in bilateral ties as well as to set the strategic direction according to which relations can further develop. Given their ideological orientations, China and Vietnam have more channels to work in towards that direction. High-level exchanges can take various forms including bilateral visits, special envoys, hotlines, annual meetings, as well as consultations on the sidelines of multilateral forums. Second, promote and improve existing collaboration mechanisms between the two Parties and countries, especially meetings between representatives of the two Politburos and the Steering Committee for the Vietnam-China bilateral cooperation for strengthening the full implementation of bilateral agreements. Moreover, the content of expert-level talks could be expanded to include more functional cooperation topics, such as establishing a marine park in overlapping claimed areas. Third, to adopt pragmatic thinking and action in regard to the more sensitive issues and areas. As such, the Paracel Islands are the most sensitive area. Although fundamental differences exist and incidents have happened more frequently here, the relevant problems have been excluded in bilateral discussions, which prevents a clear and effective management mechanism being created here. Both sides need to take a pragmatic attitude to not only put this area and adjoining sea area on the table, but also realize its deep sensitivity by creating a “no-action zone” that imposes a moratorium on certain activities such as fishing. Fourth, promote and expand functional cooperation activities. While scientific research has been carried out, and sustainable management initiated, regarding marine resources in the Gulf of Tonkin, possibilities in this regard could also be explored in the area off its mouth as well as in the Spratly Islands. Furthermore, based on existing cooperation activities in keeping good order at sea both within and off the mouth of the Gulf of Tonkin, opportunities could be explored to expand activities such as joint exercises and mutual ship visits. Both the Paracel and Spratley Islands, with due consideration to their heightened sensitivity, could also be included in this regard. The South China Sea is the major outstanding problem in China-Vietnam relations, determining to a large degree political trust, people’s sentiments, the overall trajectory of bilateral relations, as well as peace and stability in the maritime region. High-level diplomacy between China and Vietnam augers well for both countries to further strengthen mechanisms to deal with their respective issues. With creative efforts towards cooperative management from both sides, another incident like that in 2014 can hopefully be avoided. Ramses Amer is Associate Professor in Peace and Conflict Research and Associated Fellow at ISDP, Sweden. He can be contacted by email at: ramsesamer@gmail.com or ramses_a@163.com. Li Jianwei is Director and Research Fellow at the National Institute for South China Sea Studies, China. Email: jw51cn@163.com, lijianwei@nanhai.org.cn. This is an amended article that first appeared for China-US Focus on March 3. * Editor’s note: Vietnam officially refers to it as the East Sea. More widely known as the South China Sea, this name is used here without in any way conferring legitimacy on China’s claims. How Can 2017 be a New Boost on China-Vietnam Relations over the South China Sea? Japan`s Policy towards the South China Sea – Applying “Proactive Peace Diplomacy”? B.A. Hamzah analyses U.S. foreign policy in the South China Sea, and the country's inability to restrain China from pursuing its territorial ambitions in the area.